“The Nambucca River Co-operative Society Limited” was formed in 1903 as “The Nambucca Dairy Company Limited”, just a little before the formation of the “Bowraville Dairy Company” in 1905. That two dairy companies could find support in the one region is an indication of the extent of the industry in the Nambucca Valley in the late Eighteen Hundreds following initial settlement of the area by cedar getters. Eventually, after almost fifty years of separate work, the two companies merged into “The Nambucca River Co-operative Society Limited”, the name under which the society trades today. The Nambucca Valley was one of the last places to be targeted by the cedar getters, mainly because the bar at the mouth of the Nambucca River was difficult to cross. The valley was similarly one of the last places where the cedar trade continued. Logs were traded out of the valley well beyond 1870, and in the meantime farmers pushed their way into the Nambucca Valley after the enactment of the Robertson Land Act of 1861, which allowed for the conditional purchase of land. It was no easy life for farmers. The land needed to be cleared of forest by hand and horse, and initially planted with corn to feed both humans and livestock. Floods often destroyed crops, leaving farmers and their families without food, and in heavy debt. The population in the valley grew, however, and timber mills came to the towns, bringing prosperity to themselves and sometimes their employees. The Nambucca River entrance became a busy port area and ocean going vessels often stopped. Meanwhile, inland, despite difficulties for dairy herds with the local conditions, the industry began to grow, and horse-driven cream separators began to be used on some farms. Similarly, the introduction of paspalum grass, almost by accident at first, and then by intention after its ease of cultivation and suitability for the North coast of NSW was discovered, and became a driving factor for the rapid growth of the dairy industry at the turn of the century. As the dairy industry grew, mechanical separators were used communally at North Macksville, Eungai, and Talarm. Eventually local farmers realised that they needed a central location for the separation of cream and milk — somewhere that processing into butter could happen given the sometimes unreliable transport links to Sydney. 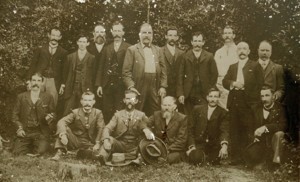 Fred Debenham of Frederickton advised them to form a company and build a butter factory, ultimately resulting in the formation of “The Nambucca Dairy Company Limited” in 1903. That company, of course, is today the “Nambucca River Co-operative Society Limited”. It no longer owns a butter factory, but sits at the leading edge of the retail market in the town of Macksville, centred on the very same plot of land originally purchased for the factory. In its first few years of operation the Nambucca Dairy Company struggled in competition with the Bowraville Company, but around 1908 a change of management and a massive increase in cream production brought prosperous times. In 1910 the directors authorised the construction of a bigger factory in North Macksville, which opened in 1912. Meanwhile, the Bowraville Dairy Company built its first butter factory near Lane’s bridge in 1907, and commissioned a second factory in Bowraville in 1914, soon followed by a bacon factory built as a part of the same complex in 1918. Similarly in 1918, the Nambucca Dairy Company built a factory at Taylors Arm, and a year later in Eungai adjacent to Lane’s Mill. 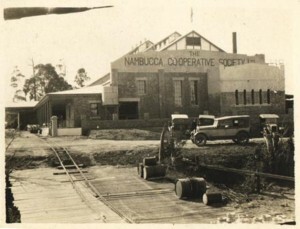 Both companies expanded in the Nambucca Valley, diversifying eventually into retail outlets, and the two merged on June 30th 1950 as the Nambucca River Co-operative Society Limited.